Take two... I already wrote out this post once, was well pleased with it, then of course Blogger decided to get rid of it all. These jeans have literally been DIYed to death. It all started back when ripped knees took over England last year, and decided to give these a little rework and cut some holes in. Back then, they were still blue acid wash, and I'm not going to lie, I was kinda over blue acid wash by that point. Even though I loved them with the rips, I still never wore them that much. A few months ago, I then spotted a photo on Pinterest (oh, Pinterest) of some distressed ankle grazers, and needed them there and then. I volunteered these jeans to once again go under chop, and off the bottoms of them came. After a few washes they got really frayed, and I love how they look now. I think if you're ripping your own jeans, you've got to give them a few washes to start fraying properly, otherwise it just looks like a clean cut through the material. But alas, they were still blue acid wash, so last week I got the washing machine dye out. They look sooo much better now, and I like that the dye didn't completely black out the acid wash. 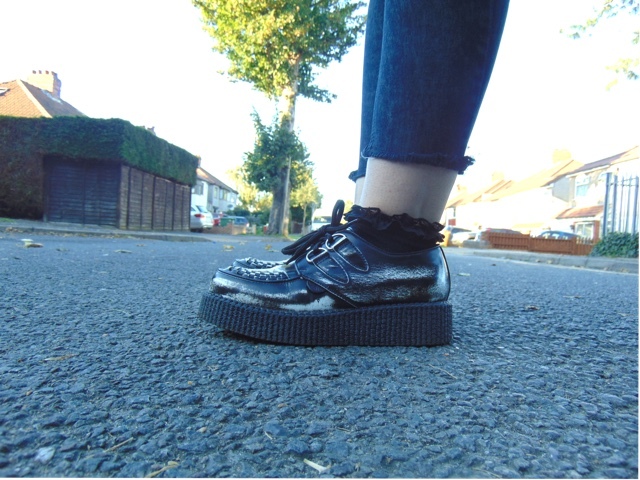 I also love how the ankles look with Creepers! I'm forever DIYing my jeans, these look great! I love the ankle grazer/crepper combo and that shirt is amazing! I've been DIY-ing my jeans, too, but have never done it this way; I should, because it looks amaing! And god, your creepers -- major love! Love this outfit, I never really thought about dying my old acid wash jeans but that's such a great idea because then I'd be able to wear them again! I always end up ruining my jeans lol. Love the look of them!! 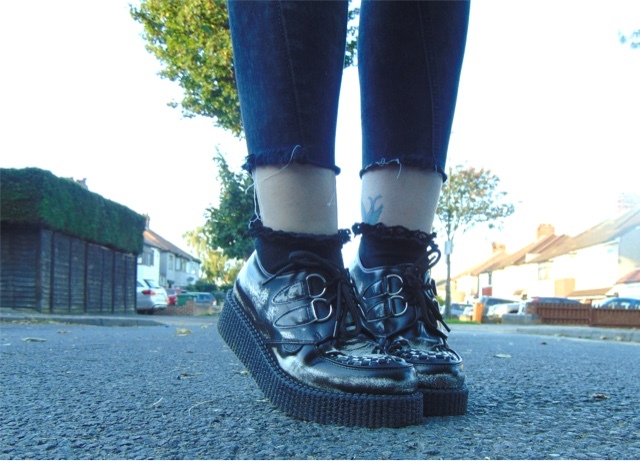 I'd love to do this with my jeans but I'd probably mess them up somehow...and those creepers - in love!! I love this look! I always dye my jeans! Once they start to fade I get the dye out! Saves money! You look amazing, and I don't think I would ever have know these jeans had been DIYed! So perfect <3 I love your shirt ! Aw, I remember you mentioning that you were thinking of colouring those jeans, I'm glad you're pleased with the result :) I really love this look! 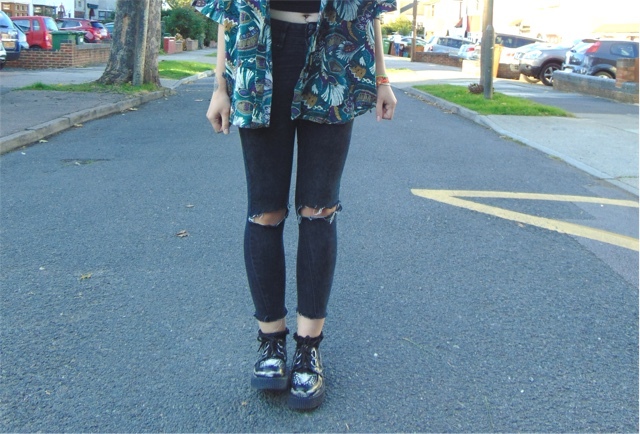 Really cool outfit, love how the creepers go with the jeans. I need to get round to diy-ing a few pairs of my old jeans. Love this outfit - the shirt is sooo pretty! 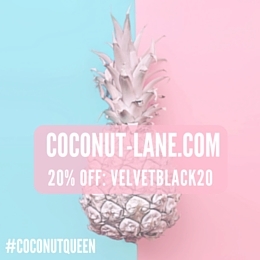 LOVE that shirt - such nice colours!! I'm not a fashion expert but I love the way your outfit looks! I love your DIY outfits, they always look so good. The pattern on the shirt looks really nice. In love with these jeans! yYour DIY's to them were prefect. 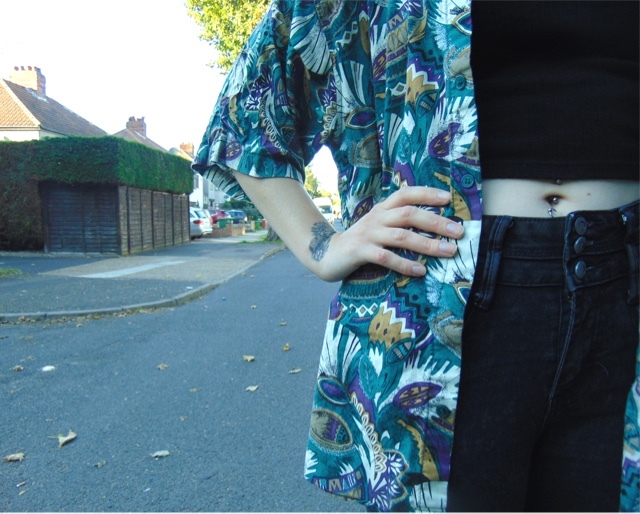 Your DIY skills are working because these jeans look perfect!! i love the shirt hahaa the print is so cute! 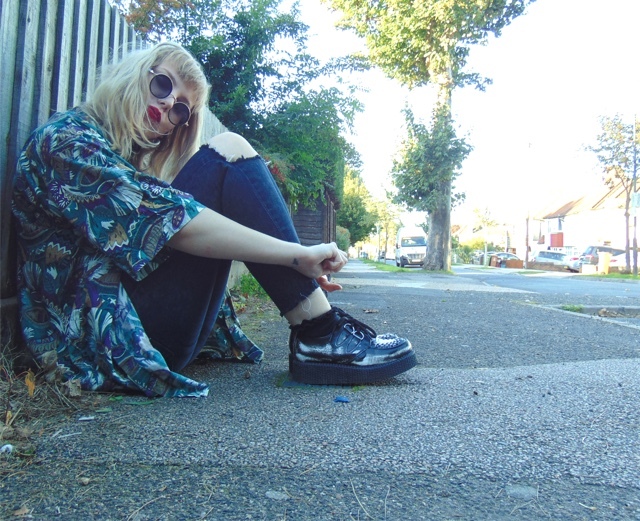 I love how you styled your creepers. I have a pair but I never know how to style them. The go perfectly with the ankle grazers and sock. Great post. So many of my clothes got ruined by damp in 2nd year, student houses are literally the worst! Have a look in TK Maxx, they seem to be getting a lot of the older Underground ones in lately!